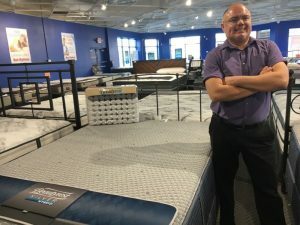 Because of our longstanding commitment to quality and customer service, Best Mattress has grown to encompass 22 locations throughout Nevada and Utah, including one location right here on Martin Luther King, Jr. Boulevard. Keep in mind that you can find information about our specials, the brands that we carry, and even our financing options right here on this website. You can even use our site to leave a comment for our manager or to pay your mattress invoice anytime. If you have other questions or concerns, feel free to call us during normal business hours at 702-384-6899. We would be more than happy to help you in any way that we can. Our 260 S. Martin Luther King Boulevard, Las Vegas, NV 89106, right between Furniture 4-Less and Costco. Also, because many of our customers visit us after they get off of work, we are open later than most of our competitors. We are eager to talk with you and help you find the best mattress you’ve ever had. Javier is a fun-loving sales person with the knowledge of 3 sales people rolled into one! Visit this sleep expert that specializes in Serta, Simmons, Tempur-Pedic, & Five-Star brands. He knows all the details about Simmons products. Whether you are looking for a BeautyRest Black, Silver or Platinum, he is the guy. Serta’s Perfect Sleeper & iComfort definitely fall within his expertise. He can pair any brand with the adjustable base of your dreams at a low price with all the protective accessories that make your sleep the best! Nothing makes our manager, Sue Reed, happier than hearing about a positive customer experience. Sue loves to talk with customers about their shopping experience and their satisfaction with our products, so that we can better serve the public. If you have any comments about your mattress or your shopping experience in general, either positive or negative, please don’t hesitate to reach out to us. We believe in listening to customers and understanding their experience. For this reason, we encourage all of our clients to call or visit our store if there is any problem whatsoever with your order, or if you simply want to tell us about your great experience. We will do everything in our power to make things right, or to reward the hardworking employee that made your day.